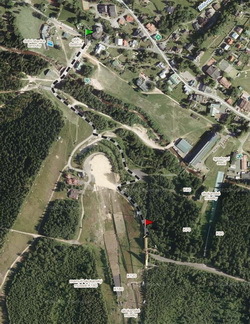 TV Tower is located in the are of ski jumps K120 and K180 next the red slopes in Harrachov. 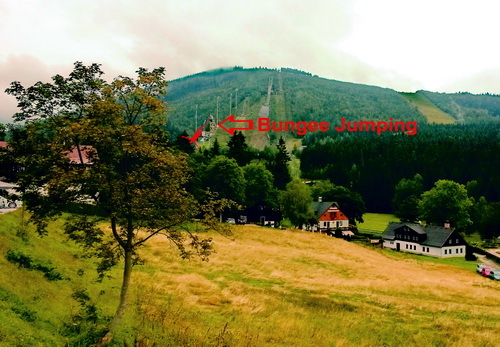 Before you park your car, during the transit through the Harrachov you are seeing Bungee Jumping resort. Then you will park your car in the parking next the chair-lift and walk about 700 meters (10 minutes) to the Television Tower. The way from the parking No. 1, you see on the map on the right side. you will walk about 487 meters (7 minutes) upstair to the roof of hotel Skicentrum, and walk the same route as if you arrived by bus. Map of ways to get there, is down on the left (below this text). You've come to Harrachov by bus? You have arrived at the bus station Harrachov. 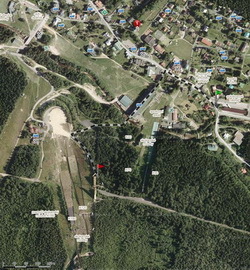 That are about 767 meters (12 min.) on foot. Map of ways to get us, is down on the left (below this text). You've come to Harrachov by train? You've come to the train station Harrachov - Mýtiny. That are about 4 km walk (61 min.) on foot. Map of way, is down on the right (below this text). We offer you the best experience in bungee jumping in the Czech Republic - this is no exaggeration. When you jump Bungee in Harrachov - Get yourself on television tower to a height of 145 meters above the town of Harrachov, and it is an experience in itself. In Harrachov, as the only place in the Czech Republic, you can jump Bungee throughout the year from January to December, the weather does not play any role. "Generally, the colder the weather, the greater the dose of adrenalin. In winter you can jump on a snowboard or snowblades. And throughout the year you learn to jump and flips backwards or forwards."